New Delhi: In a bid to give more government institutions an opportunity to apply for DNB and FNB courses, the National Board of Examinations (NBE) has extended the Cut-off dates for government-run medical institutions. The information to this effect comes via a recent notice uploaded on the official website of NBE which clearly mentions that the cut-off dates has been further extended to submit Main & Specialty Specific Applications ONLY for those hospitals/institutions which are owned by Central Government / State Government / Public Sector Undertakings (PSU) / Municipal Corporation / AFMS. National Board of Examinations (NBE) accredits hospitals/institutions for running DNB programme in various Broad & Super Specialty and Fellowship programme in various sub speciality areas. Medical Dialogues team had earlier reported that NBE now inviting applications from hospitals/institutions/medical colleges for seeking fresh/renewal of accreditation in various DNB/FNB programme for the year 2019 in NBE prescribed format. For the same, the NBE has also released the information bulletin on its official website. The information bulletin contains details of minimum requirement(s) / criteria for seeking fresh/renewal of accreditation with NBE and the process to submit applications to NBE. The precribed cut off date for Online Registration of applications and Upload of Accreditation Processing Fees is decided to be May 5 2019 (till 23:59 hrs), Completion & Submission of Applications ONLINE (Main & Specialty Specific Both) at May 10 2019 ( till 23:59 hrs) and Submission of Hard copy Print Outs of Applications to NBE (Main & Specialty Specific Both) at May 15 2019. National Board of Examinations (NBE) has invited the accreditation applications for the Year 2019 to vide NBE notification dated 13-02-2019. In continuation of NBE notice dated: 07th March 2019 & 13th March 2019, it has been decided to extend the cut-off dates further to submit Main & Specialty Specific Applications ONLY for those hospitals/institutions which are owned by Central Government / State Government / Public Sector Undertakings (PSU) / Municipal Corporation / AFMS. 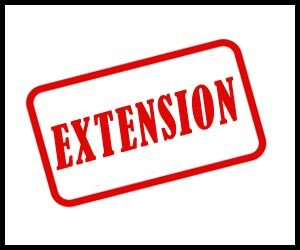 This extension shall NOT be applicable to any hospital/institution other than above.